This method is developed by considering that high energy is associated with oceanic waves when they cause Tsunami. A utilization of this high energy in rotating fans can result in potentially reducing the chances of Tsunami. 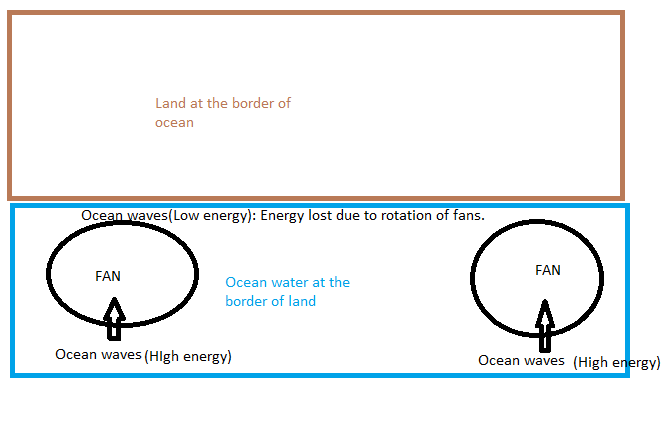 Tsunami can be stopped by developing fans (big and small) that will get rotated when the energy level of ocean waves increases at the border of land. The high energy level associated with the ocean water will thus be utilized in rotating the fans and thereby potentially reducing the chances of reaching the land. These fans that can rotate must be attached both above and below the surface of ocean water (at the border of land and also at few miles near to the border). The fans for stopping high energy ocean waves from reaching the land will be so developed that any strong movement in ocean water will cause its movement. This means that energy of one form will get converted to energy of another form due to these fans. Also, it will be possible to move these fans from several points in its body.